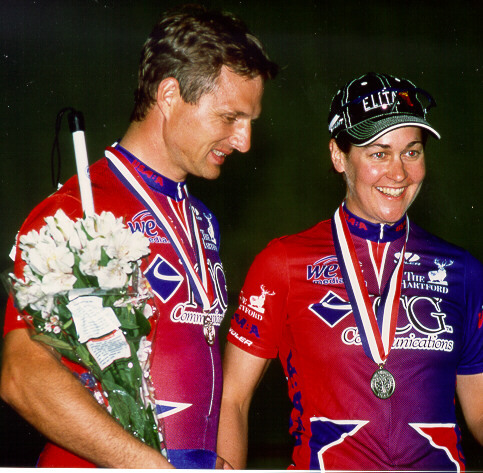 Karen Dunne and Matt King win silver at the 2000 Paralympic Track Trials in Frisco, Texas. About Karen: Karen is a 1986 graduate of Troy (Mich.) High School. Karen earned NCCA Track All-America honors three times (1990, 1992 and 1994). Karen was a member of the diving team in high school and college and began cycling in 1990. When it comes to race savvy and determination, Karen is one to be relied upon. Her instincts for racing make her a constant threat and when it comes to field sprinting, whether it is in a criterium, road race or points race, you can always count on Karen to contest the win.